Parentheses, meaning brackets in French, is a designer's watch, with pure lines and a strong identity. Besides its outstanding outlook, Parentheses, a true designer’s masterpiece, represents a formidable technical feat. It is a watch without a case and without a case back, which are the principle elements of traditional watches. 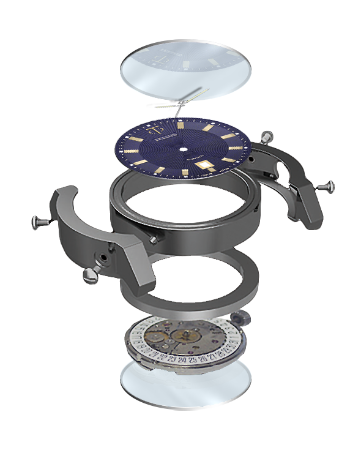 Parentheses features a unique watch frame made of five pieces, a cylindrical body which holds the movement and dial, two “brackets” in solid stainless steel, and sapphires on the top and bottom of the watch. The watch is patented for its closing system; the water resistance of the watch is secured through pressure, which is applied by adjusting the “brackets” to the watch body. Rubber O rings lie in rails on the top and bottom of the Cylinder, securing a 5 atm Water resistance. 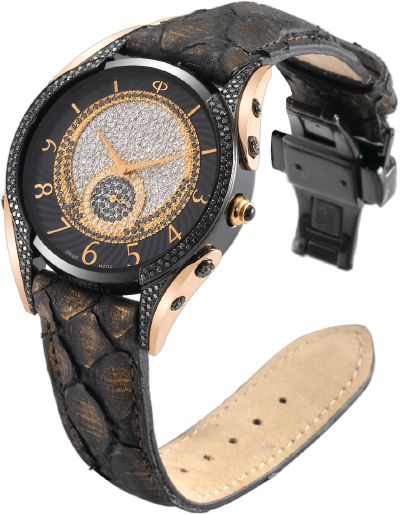 In addition to its exclusive design, Parentheses is probably the first watch with an exchangeable case. Consumers can replace the brackets at will. Distinguished by four additional elements complementing the Parentheses, this timepiece makes room for further color combinations. Screws of two different sizes which are luxuriously ornamented with rubies, sapphires, emeralds or simply diamonds, hold the various elements of the case in perfect harmony with the watch. The elements are set on the case, thanks to 8 screws of two different sizes, each of them decorated with a precious stone, in harmony with the watch, rubies, sapphires, emeralds or simply diamonds. 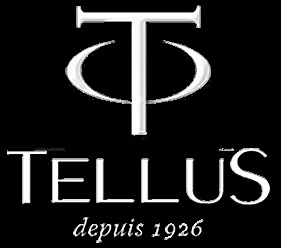 The in-house conceived screwdriver offered by Tellus is designed to tighten or loosen the screws, change the Parentheses or other elements of the watch without damaging them.